One in six US adults wears contact lenses, and virtually all engage in some form of risky behavior concerning lens care. Those are a few highlights of a new report from the US Centers for Disease Control (CDC) on contact lens wearer demographics and behavioral influences on risk of contact lens-related eye infection, part of the organization’s Morbidity and Mortality Weekly Report. Certain cosmetic products may have a significant adverse effect on contact lens shape, wettability and optical performance, report studies published in the July 2015 Eye & Contact Lens. Researchers in Canada coated seven silicone hydrogel lens materials with nine marketed brands of cosmetics: three hand creams, three eye makeup removers and three mascaras. Patients with good unilateral visual acuity may be better candidates for a Boston keratoprosthesis (BKPro) implant than previously believed, reports a study in the September 2015 Cornea. Previously, implantation was only considered for patients with severe bilateral visual impairment, due to long-term risk and low expectations. Check out more articles from the September issue of RCCL here! GPs: Are You Making Good Use of Your Diagnostic Fitting Sets? Have a topic you want to see discussed? Want to comment on an article? We want to hear from you! Contact us with your feedback and suggestions. The contact lens industry has nearly perfected mass production of stock lenses—and lately, custom specialty lenses like sclerals, multifocals and orthokeratology lenses are beginning to flourish. With so many options, it’s hard to know what to choose and how to use it. 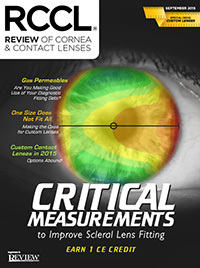 To help, the September issue of Review of Cornea & Contact Lenses is devoted to improving your understanding of the different custom contact lenses available today. Below are 20 pearls shared by experts in the field. For more detail, click through to read the original articles for each. Review of Optometry® is published by the Professional Publications Division of Jobson Medical Information LLC (JMI), 11 Campus Boulevard, Newtown Square, PA 19073. To ensure delivery, please be sure to add revoptom@lists.jobsonmail.com to your address book or safe senders list. Click here if you do not want to receive future emails from Review of Optometry.